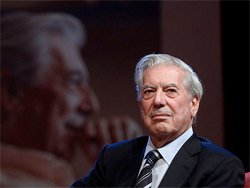 Mario Vargas Llosa's The Temptation of the Impossible. The old man has always been a Romantic. It is easy to picture him there in the military boarding school in Lima, 1950. He describes it to us in four words; damp, gray, boring, unhappy. That was Mario Vargas Llosa 60 years before he won the Nobel Prize for literature.